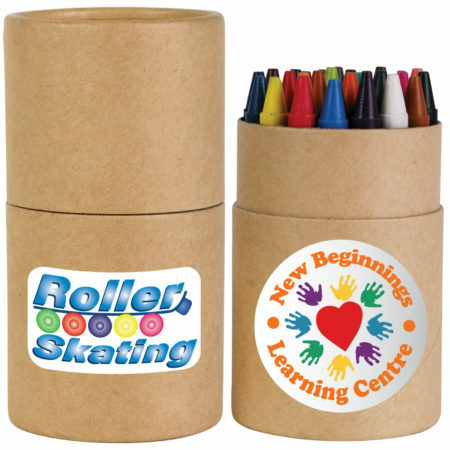 There aren’t too many places where you can pick up custom designed promotional crayons, but if you run a childcare centre, library or other child friendly place, why shouldn’t you be promoting your business to parents via a crayon tube? There are so many options with promotional crayons, and our custom designed crayon tubes provide you with lots of branding opportunities. These tubes have two print spaces – the tube base has a print space of 182mm x 51mm while the lid has a print space of 182mm x 59mm; you’ll have plenty of logo print space to help get your brand across. These branded crayon tubes and crayons are completely child friendly – the tube is made of cardboard while the 30 crayons are simple non-toxic wax crayons. The Custom Designed Cardboard Tube with crayons are a great, bright and bold way to get your brand out there and with so many promotional opportunities, you can bet that parents will remember exactly who you are. Custom Design Assorted Colour Crayons in Cardboard Tube.